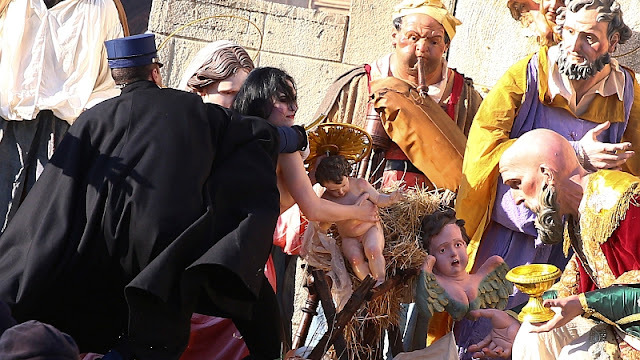 A bare-chested Femen activist tried to steal the baby Jesus figure from Vatican Nativity scene on St. Peter's Square. In addition she yelled according to media reports "God is female"; This was also painted on her bare back. However, the Vatican gendarmerie stopped the woman in time and quickly threw her a black coat. The action took place about two hours before Pope Francis read his Christmas message in St. Peter's Square and donated the traditional blessing "Urbi et orbi". This is not the first time that Femen activists have attempted to rob the baby Jesus in St. Peter's Square; in 2014, the group made headlines with it.